Scientists tell us we actually need good fats like those found in nuts. A recent study of 26,473 Americans found obesity to be less common among people who consume nuts, which contain essential fatty acids that stimulate the body’s burning of fat and dissolve hard, saturated fat. In addition, nuts are nutrient-dense, containing protein, vitamins, iron, calcium, magnesium and potassium. Whole brown or black sesame seeds (the kind we sell in the store) contain more calcium than milk in a form that is easily absorbed and assimilated by the body. A half-cup of sesame seeds contains 1,125 milligrams of calcium, compared with 590 milligrams per pint of milk. Whole brown sesame seeds contain magnesium too. Magnesium relaxes the muscles and is good for the heart (and, as they say, much, much more). Did you know that calcium won’t work without magnesium? Two tablespoons of whole sesame seeds give you a third your daily requirement of magnesium. What do I mean by “whole” sesame seeds? Whole sesame seeds have the hull, and it’s the hull that protects the seed from rancidity and which contains most of the minerals. Use whole sesame seeds in your kitchen, and you won’t notice any difference in flavor or taste. You will notice the nutrient difference if you compare sesame tahini or sesame butter made from white, hulled sesame seeds with the whole tahini or sesame butter. The tahini made from white, hulled seeds lists no magnesium on the nutrition facts label. Two tablespoons of this lesser stuff contain only 2% of the daily calcium requirement. On the other hand, two tablespoons of whole tahini, made from the brown, unhulled or black seeds, contain between a quarter and a third of your daily calcium requirement. It gives you a third of your daily magnesium requirement. Isn’t that a stunning difference? Other cultures revere nuts and seeds for their health-giving properties: sunflower seeds were worshipped by the Incas. Today this “survival food” is a staple in Russia, where scientists believe the seeds have the ability to draw excess radiation out of the body. The walnut, a native of the Middle East, was carried to Europe by the Romans. 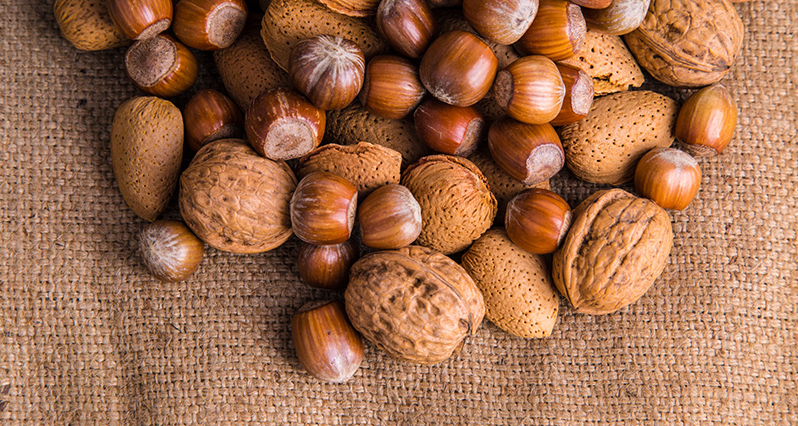 A recent study found walnuts reduce serum cholesterol levels in the blood. One fifth an almond’s weight is protein and cosmetologists tout the almond’s ability to keep hair shiny and skin silky. An Australian study found men with normal cholesterol who ate three ounces of almonds a day for three weeks cut total cholesterol by 7% and bad/LDL cholesterol by 10%. My mother always gave my father his handful of pumpkin seeds each day because pumpkin seeds are loaded with the mineral zinc, which reputedly helps prevent prostate problems. Zinc also helps boost our immune system and heal wounds. An old-fashioned remedy to expel worms says to eat a handful of pumpkin seeds every four hours. And, yes, pumpkin seeds also, just like sesame seeds and many other nuts and seeds, contain magnesium which we know processes and utilizes calcium. I find it interesting that researchers say magnesium deficiency is a growing problem in this country because we Americans consume too much sugar and drink too many carbonated drinks, which causes magnesium depletion. Brazil nuts are another favorite nut because they are rich in selenium, a nutrient that helps “cure” the moody blues. It’s said that eating about just two to four Brazil nuts a day increases the blood selenium levels by about 64%. (Similar results were found when people were given a 100 microgram selenium supplement.) So if you’re a little sad, craving sunshine, try a couple of Brazil nuts each day and see if it doesn’t help. Another reason all nuts and seeds are so important is that they contain essential fatty acids, those so-called good fats which the body cannot synthesize or manufacture. We have to get our essential fatty acids from food or supplements because they are needed by every cell in the body. Over time, a deficiency of essential fatty acids may manifest itself as high cholesterol, high blood pressure, abnormal hormonal activity, wounds that don’t heal properly, cardiovascular disease and loss of mental capacity. The last nut or seed I’ll mention today is another one of my favorites: pistachios. Yep, they’re high in fat, 72% fat, which is why when I eat a pound of them, I gain weight. But when I restrain myself and just throw a handful on as a delicious salad garnish, I gain mucho benefit because they have lots of protein, fiber and B vitamins (the nerve and stress vitamins). Two ounces of pistachios give us more potassium than a banana. And as all nuts and seeds, they help lower cholesterol. Like with all things good, balance and moderation are key. Two to five tablespoons of nuts and seeds a day seems about right to help lower the risk for diabetes, heart disease, obesity and cancer. So throw a handful of walnuts into a garlicky tossed salad. Garnish a fresh fruit salad of strawberries and raspberries with slivered almonds. Toast sunflower seeds and eat with a handful of raisins. Bake squash and drizzle with maple syrup and top with toasted nuts. Add flax seeds to cooked oatmeal or knead them into homemade bread. Drizzle sesame tahini over a ripe banana as breakfast.